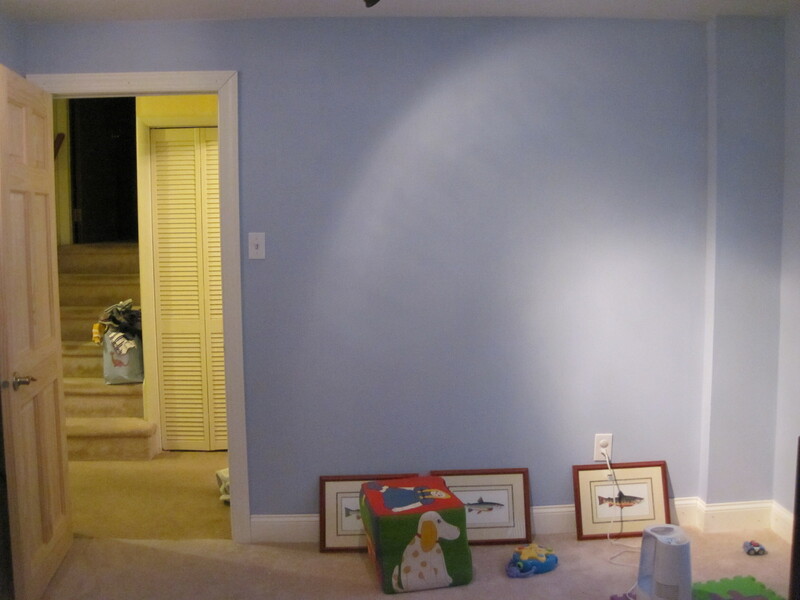 When we struggled through the baby’s room remodel, we put off one project that we didn’t have time to tackle before the baby was born. Apparently we didn’t have time to tackle it for another 15 months after he was born either (oops). That project? 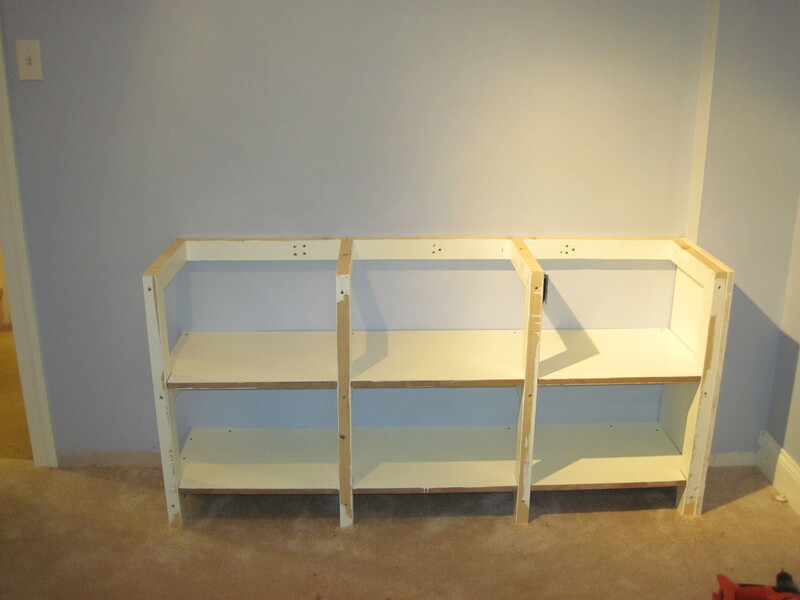 Built-in storage. As you can imagine, babies need a lot of storage. They have more toys and equipment than the rest of the family combined. 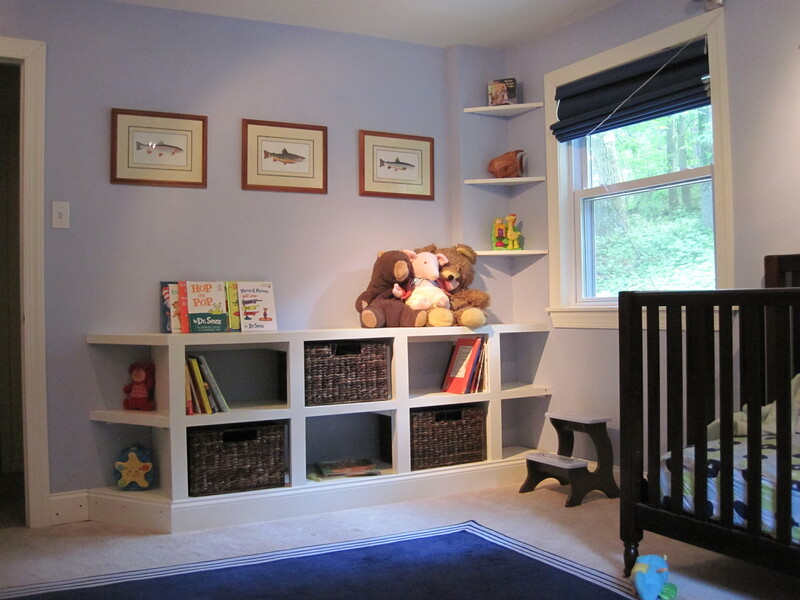 When we originally planned the layout of the baby’s room, we anticipated putting built-in storage in the front of his room, next to the door. 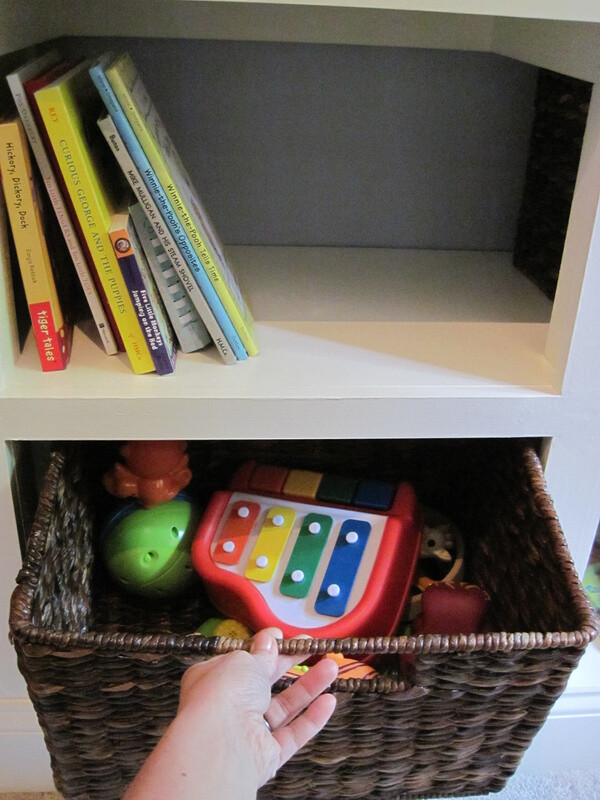 We wanted open shelves that perfectly fit storage baskets that would be easy for a small child to use, as he starts to learn how to clean up. We ran over to Home Depot to buy supplies. 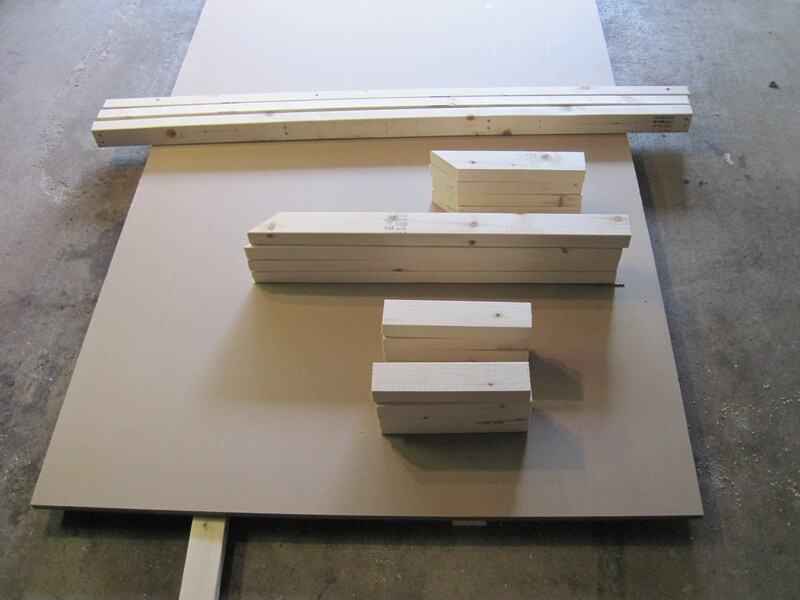 We picked up some MDF (medium-density fiberboard) for the shelving and 2x3s for the frame. 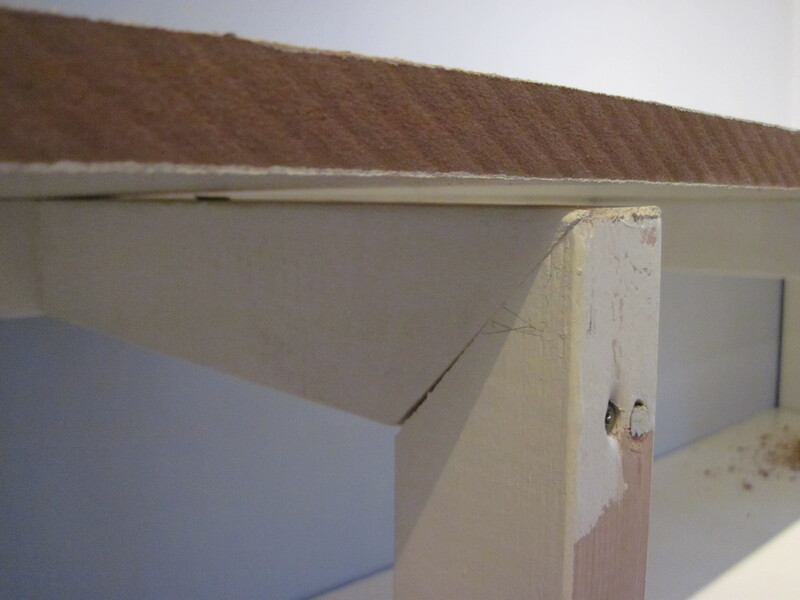 MDF does not have any fancy grain like real wood, but we don’t need fancy wood since we’re going to paint it. The descriptions probably aren’t too much help but you’ll understand as you see them in action … read on! 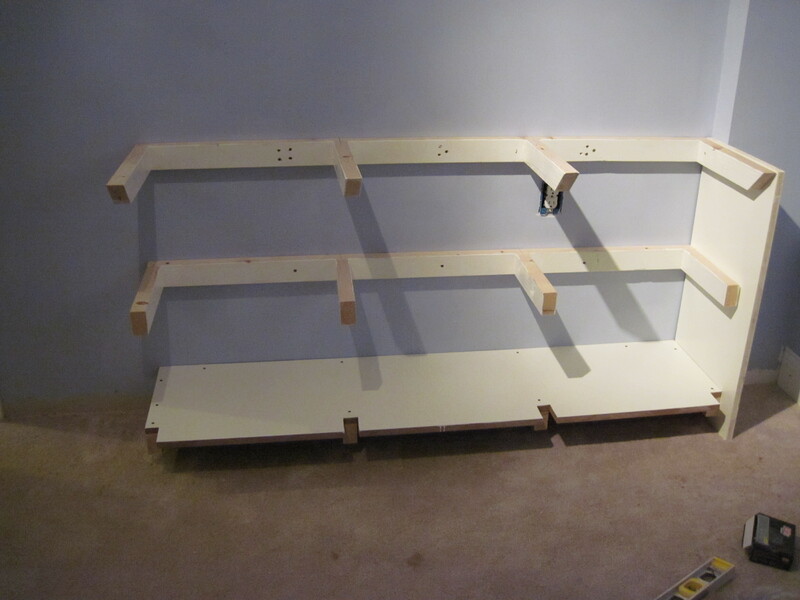 You’ll see the cut-outs in the shelf for the front supports. 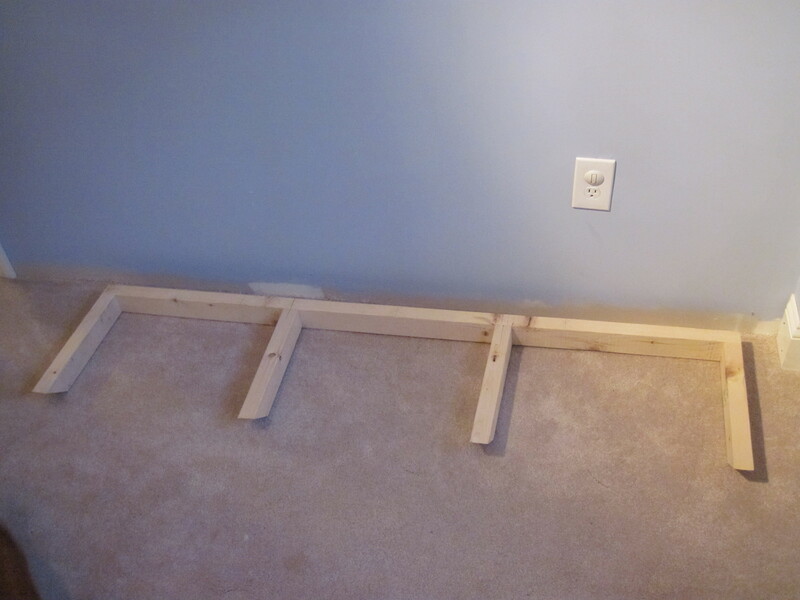 They fit through so that the front of the built-ins are flat. 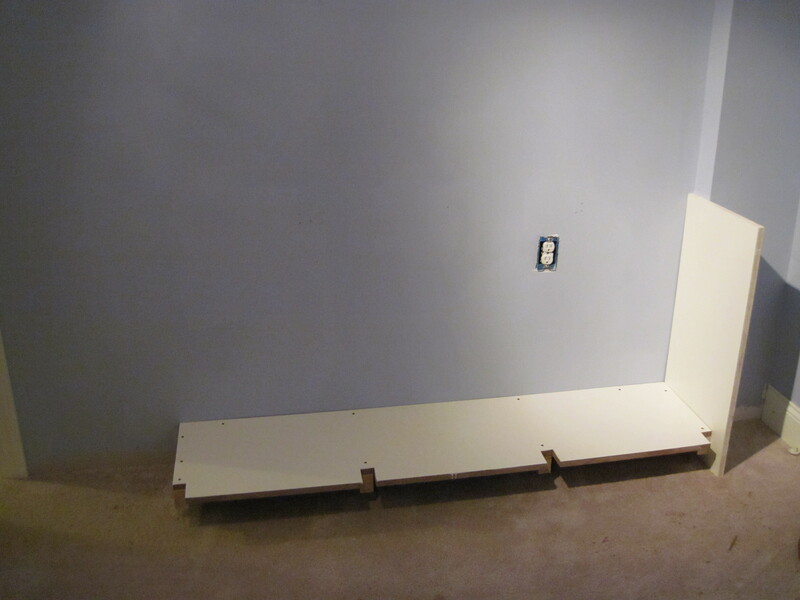 A shelf was slated to go straight across the outlet. Guess what? Time to move an outlet! 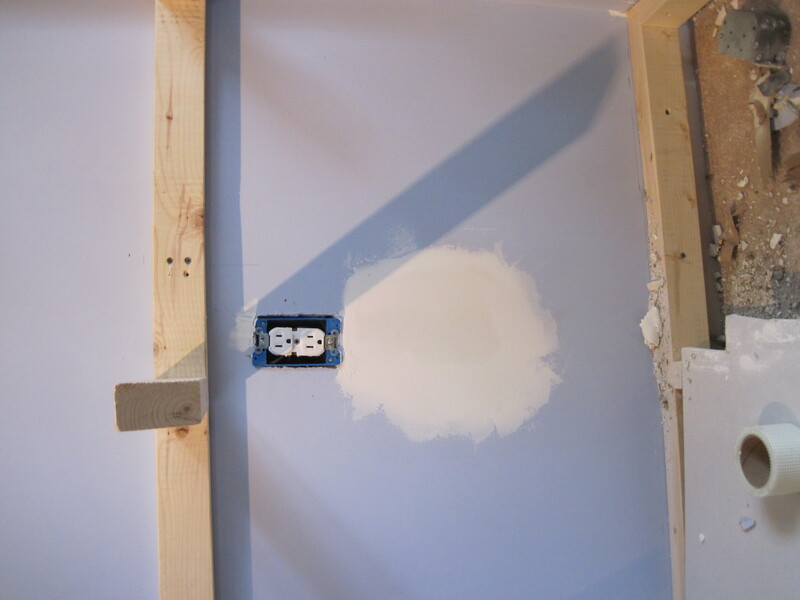 We turned off the power to the house, cut a new hole in the outlet’s new location, and moved the wires and junction box to the new hole. We also replaced the junction box with a newer, more modern one. 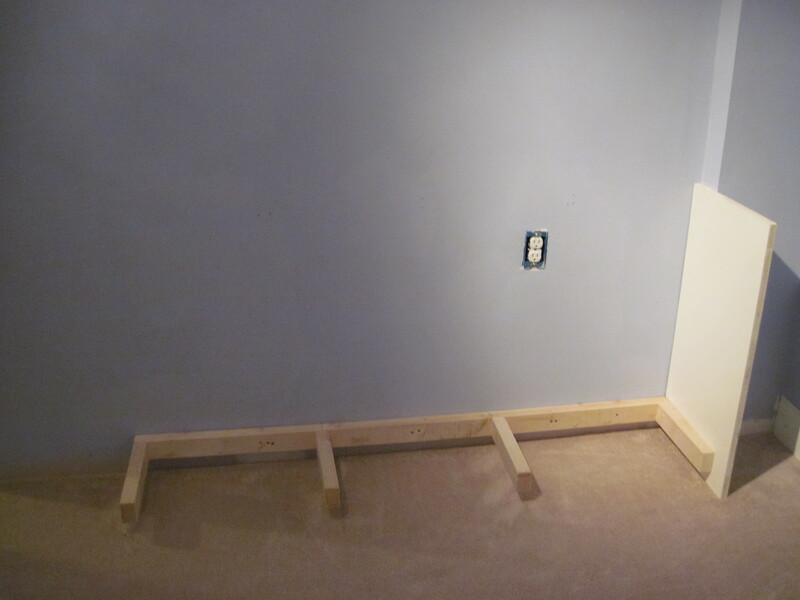 We prefer to have new wiring in the room where our baby sleeps. You’ll notice that the top and bottom scaffolds were installed, but not painted when we moved the outlet. That brings us to our Whoops Moment. We started installing the scaffolds and realized that we forgot to allow space for our right side panel. We had to unscrew the scafffolds and try again. Anyway, where did we leave off? 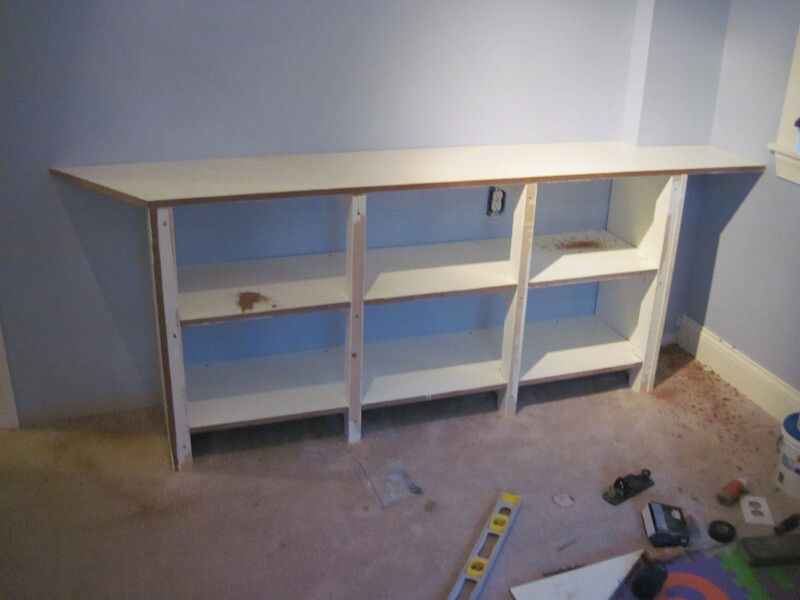 Oh right… we had the scaffolds up and a shelf. We fixed it using a door shim we had left over from installing the porch door last year. We just cut off the end with a jigsaw and continued on our way. 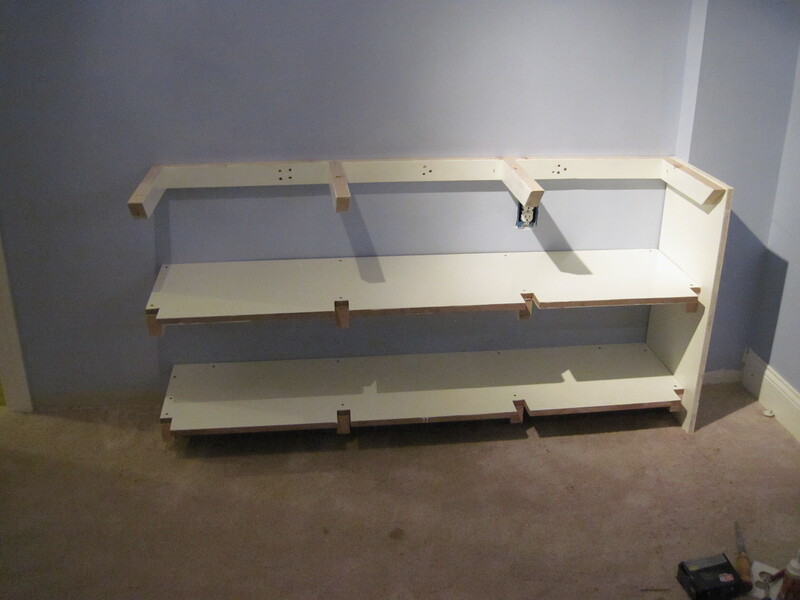 We added the side shelves and some trim. We glued the trim on (in addition to screwing it in) and sanded down the top so the top was very smooth (but messy looking). 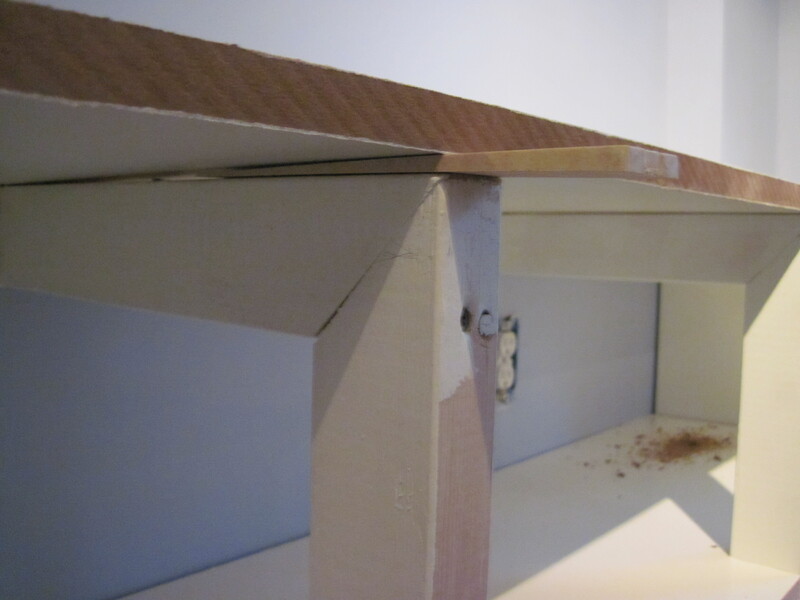 We like to use glue and screws because the glue creates a really tight seal against the wall. Finally, we loaded them up with stuff! See those exposed nails? We’ll fill them in. We haven’t done it yet and wanted to celebrate completing the project with you as soon as possible! So, after thinking about it for nearly two years (and taking a solid 2 months to construct them), we’ve finally got some awesome built-ins in the baby’s room! Let’s look at it one more time (humor us). AWESOME! 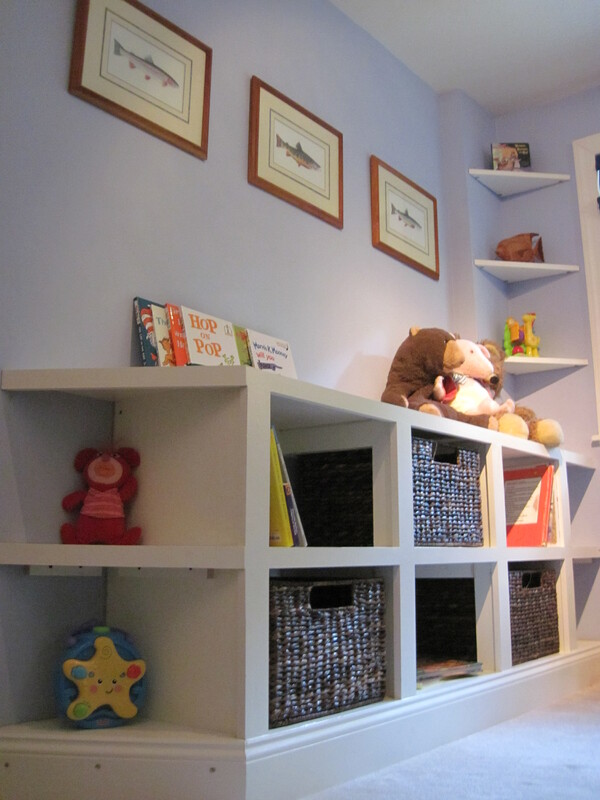 I personally LOVE how you made the bottom shelf match the molding height so the shelves fit seamlessly into the room!